Making meringue cookies is easier than you might think. All you need are 4 simple ingredients and about 10 minutes of prep time. When your done, you’ll wonder why you haven’t done this sooner. So, grab your standing mixer. Bring out the sugar, salt, egg whites, and cream of tartar; And lets have some fun! 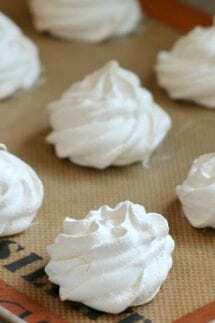 I’ve included some helpful tips and the recipe below so you can make the perfect meringues. I am totally newly obsessed with Meringue Cookies. 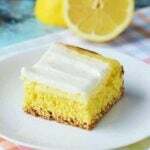 They give off a light airiness, and they have just the slightest crunch on the outside, but a marshmallow like interior. What is also wonderful about them is that they are less than 20 calories. So, they can satisfy your sweet tooth, without the guilt. We love easy and quick recipes like this one. If you are ever in a pinch, you will love these Cake Mix Cookies. They are quick and easy, too! You probably already have everything you need in your pantry! 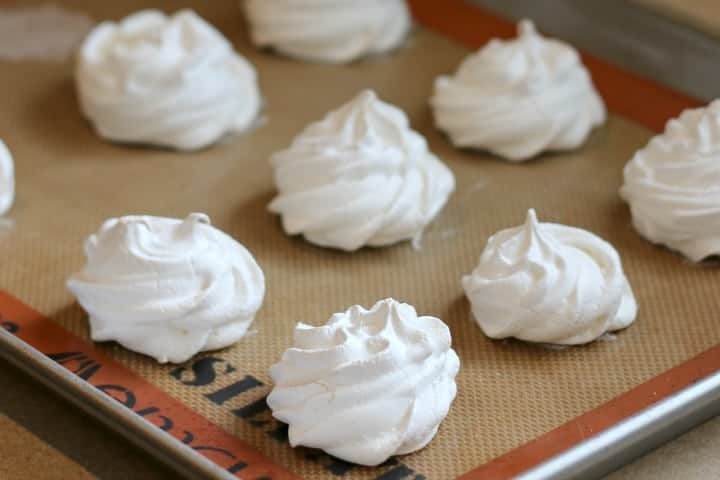 Follow these great tips for meringues that will turn out perfectly every time! SUPER DUPER IMPORTANT: You need dry equipment. Make sure that your mixing bowl and beater are meticulously clean and dry. 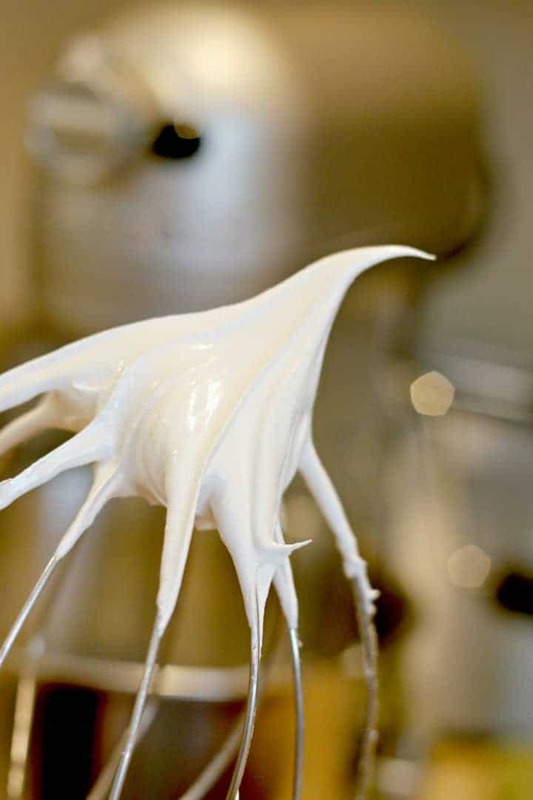 Any trace of moisture will turn your meringues into an epic fail. Add the sugar slowly to give it time to incorporate. Separate your eggs cold, straight out of the fridge and be sure to crack the shell on the flat counter and not the edge of the bowl. The cold eggs separate better and cracking the shells on the counter keeps out pieces of shell and yolk. Then leave them to warm to room temperature, before you start in. Beat until the peaks are stiff. When they stand up straight on the end of your beater, it’s ready. FYI – I used my Kitchen Aid stand mixer and used the whisk attachment. Store Meringue cookies in an airtight container. They last for a long time (even a week or two). How do you know when meringue cookies are done? Meringue cookies are meant to be very light and have a bit of a crunch. 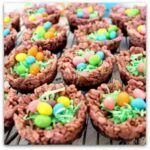 You don’t want to let them get to the “browning” stage in baking. They should be able to easily come off of your baking sheet. You may need to slide a spatula under them, but it shouldn’t take much effort. Mine can generally be lifted off the silicon baking sheet with no problem at all! How long can I store meringue cookies? 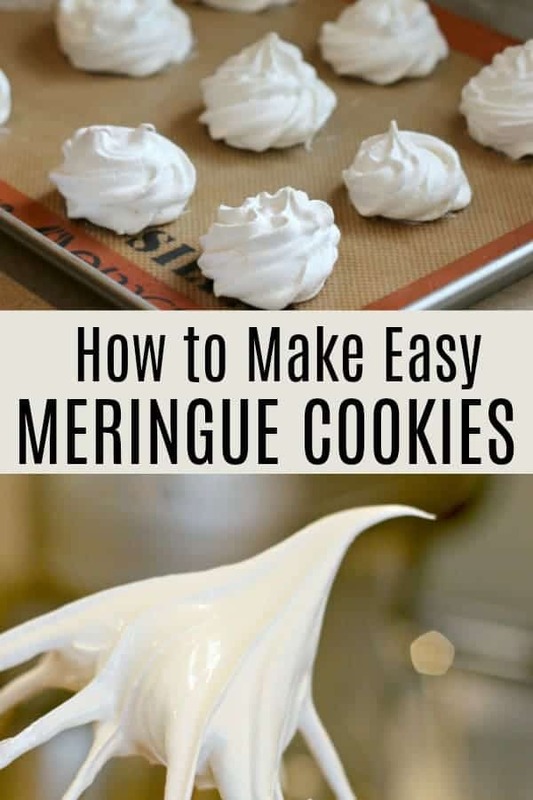 Meringue cookies can be stored for up to two weeks. However, make sure to keep them in an airtight container and in a cool and dry place. Making meringue cookies is easier than you might think. All you need are 4 simple ingredients and about 10 minutes of prep time. Grab your standing mixer and some sugar, salt, egg whites, and cream of tartar. Preheat oven to 225ºF. Line a cookie sheet with parchment paper or silicon baking sheet. Turn the mixer to high speed and with the mixer running, add sugar, one tablespoon at a time, until sugar is dissolved and mixture looks thick and shiny and still peaks form (see photo above - it will take approx 5-7 min). If you don’t have a pipping bag, you can use a spoon to make mounds of meringue on the baking sheet. Place the baking sheet into the preheated oven and bake for 45 minutes, then turn oven off. DO NOT OPEN THE DOOR. Let cookies stand in oven for 1 -2 hours until completely cooled. 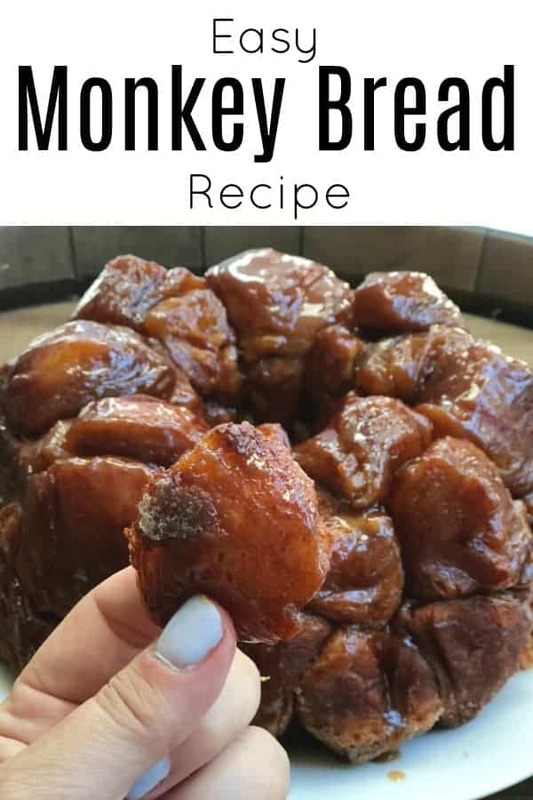 Our other newest obsession is our crazy easy Monkey Bread Recipe. It will be your new go-to dessert. Just use store bought biscuits and four other simple ingredients and you will have a delicious cinnamon sugar dessert. 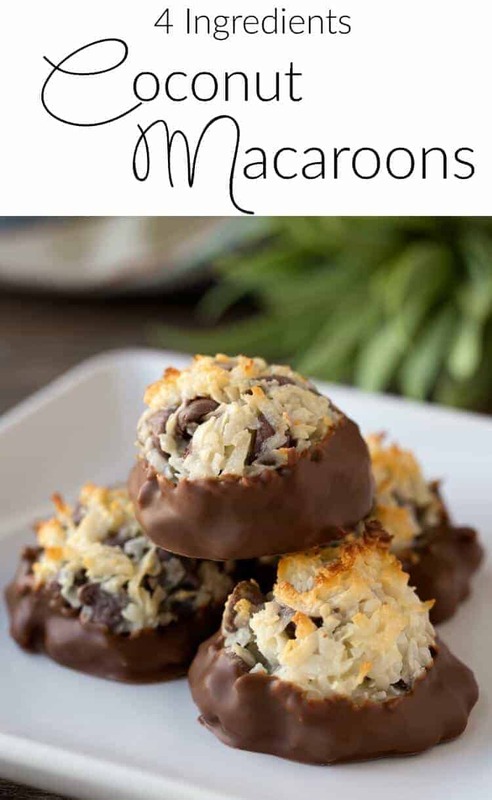 Coconut Chocolate Chip Macaroon Recipe – This sweet and chewy dessert with only 4 ingredients will be your new favorite! I consider myself quite a tough critic. However, this recipe is fenominal. I wish there was a way to give 4 1/2 stars, because the flavor was perfectly executed, and the center was super soft. The reason I am not giving 5 stars, is because the food coloring makes it bubble over. Otherwise, it is a well done recipe. I recommend doing small cookies, about 1 inch in diameter, and cooking them for 35 minutes if you like a soft center.